What constitutes a “real” refugee? Refugee and Forced Migration Studies has grown from being a concern of a relatively small number of scholars and policy researchers in the 1980s to a global field of interest with thousands of students worldwide studying displacement either from traditional disciplinary perspectives or as a core component of newer programmes across the Humanities and Social and Political Sciences. Today the field encompasses both rigorous academic research which may or may not ultimately inform policy and practice, as well as action-research focused on advocating in favour of refugees' needs and rights. Refugee identity is often shrouded in suspicion, speculation and rumour. Of course everyone wants to protect “real” refugees, but it often seems – upon reading the papers – that the real challenge is to find them among the interlopers: the “bogus asylum seekers”, the “queue jumpers”, the “illegals”. Yet these distinctions and definitions shatter the moment we subject them to critical scrutiny. In Syria, no one would deny a terrible refugee crisis is unfolding. Western journalists report from camps in Jordan and Turkey documenting human misery and occasionally commenting on political manoeuvring, but never doubting the refugees’ veracity. But once these same Syrians leave the overcrowded camps to cross the Mediterranean, a spell transforms these objects of pity into objects of fear. They are no longer “refugees”, but “illegal migrants” and “terrorists”. However data on migrants rescued in the Mediterranean show that up to 80% of those intercepted by the Italian Navy are in fact deserving of asylum, not detention. Other myths perpetuate suspicion and xenophobia. Every year in the UK, refugee charity and advocacy groups spend precious resources trying to counter tabloid images of a Britain “swamped” by itinerant swan-eaters and Islamic extremists. The truth – that Britain is home to just 1% of refugees while 86% are hosted in developing countries, including some of the poorest on earth, and that one-third of refugees in the UK hold University degrees – is simply less convenient for politicians pushing an anti-migration agenda. We are increasingly skilled in crafting complacent fictions intended not so much to demonise refugees as exculpate our own consciences. In Australia, for instance, ever-more restrictive asylum policies – which have seen all those arriving by boat transferred off-shore and, even when granted refugee status, refused the right to settle in Australia – have been presented by supporters as merely intended to prevent the nefarious practice of “queue-jumping”. In this universe, the border patrols become the guardians ensuring “fair” asylum hearings, while asylum-seekers are condemned for cheating the system. That the system itself now contravenes international law is forgotten. Meanwhile, the Sri Lankan asylum-seeking mothers recently placed on suicide watch – threatening to kill themselves in the hope that their orphaned, Australian-born children might then be saved from detention – are judged guilty of “moral blackmail”. Population fleeing their villages due to fighting between FARDC and rebels groups, Sake North Kivu the 30th of April 2012. © MONUSCO/Sylvain Liechti (from Opening ceremony of new PNC headquarters in Goma). Licensed under CC BY-SA 2.0 via Wikimedia Commons. Such stories foster complacency by encouraging an extraordinary degree of confidence in our ability to sort the deserving from the undeserving. The public remain convinced that “real” refugees wait in camps far beyond Europe’s borders, and that they do not take their fate into their own hands but wait to be rescued. But this “truth” too is hypocritical. It conveniently obscures the fact that the West will not resettle one-tenth of the refugees who have been identified by the United Nations High Commission for Refugees as in need of resettlement. In fact, only one refugee in a hundred will ever be resettled from a camp to a third country in the West. In January 2014 the UK Government announced it would offer 500 additional refugee resettlement places for the “most vulnerable” refugees as a humanitarian gesture: but it’s better understood as political rationing. Research shows us that undue self-congratulation when it comes to “helping” refugees is no new habit. Politicians are fond of remarking that Britain has a “long and proud” tradition of welcoming refugees, and NGOs and charities reiterate the same claim in the hope of grounding asylum in British cultural values. But while the Huguenots found sanctuary in the seventeenth century, and Russia’s dissidents sought exile in the nineteenth, closer examination exposes the extent to which asylees’ ‘warm welcome’ has long rested upon the convictions of the few prepared to defy the popular prejudices of the many. Poor migrants fleeing oppression have always been more feared than applauded in the UK. In 1905, the British Brothers’ League agitated for legislation to restrict (primarily Jewish) immigration from Eastern Europe because of populist fears that Britain was becoming ‘the dumping ground for the scum of Europe’. Similarly, the bravery of individual campaigners who fought to secure German Jews’ visas in the 1930s must be measured against the groundswell of public anti-semitism that resisted mass refugee admissions. British MPs in 1938 were insistent that ‘it is impossible for us to absorb any large number of refugees here’, and as late as August 1938 the Daily Mail warned against large number of German Jews ‘flooding’ the country. In the US, polls showed that 94% of Americans disapproved of Kristallnacht, 77% thought immigration quotas should not be raised to allow additional Jewish migration from Germany. All this suggests that Western commitment after 1951 to uphold a new Refugee Convention should not be read as a marker of some innate Western generosity of spirit. Even in 1947, Britain was forcibly returning Soviet POWs to Stalin’s Russia. Many committed suicide en route rather than face the Gulags or execution. When in 1972, Idi Amin expelled Ugandan’s Asians – many of whom were British citizens – the UK government tried desperately to persuade other Commonwealth countries to admit the refugees, before begrudgingly agreeing to act as a refuge of “last resort”. If forty years on the 40,000 Ugandan Asians who settled in the UK are often pointed to as a model refugee success story, this is not because but in spite of the welcome they received. Many refugee advocates and NGOs are nevertheless wary of picking apart the public belief that a “generous welcome” exists for “real” refugees. The public, after all, are much more likely to be flattered than chastised into donating much needed funds to care for those left destitute – sometime by the deliberate workings of the asylum system itself. But it is important to recognise the more complex and less complacent truths that researchers’ work reveals. For if we scratch the surface of our asylum policies beneath a shiny humanitarian veneer lies the most cynical kind of politics. Myth making sustains false dichotomies between deserving “refugees” there and undeserving “illegal migrants” here – and conveniently lets us forget that both are fleeing the same wars in the same leaking boats. Katy Long is Lecturer in International Development at University of Edinburgh. 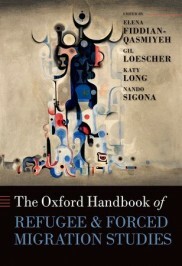 She edited, together with Elena Fiddian-Qasmiyeh, Gil Loescher, and Nando Sigona, The Oxford Handbook of Refugee and Forced Migration Studies.